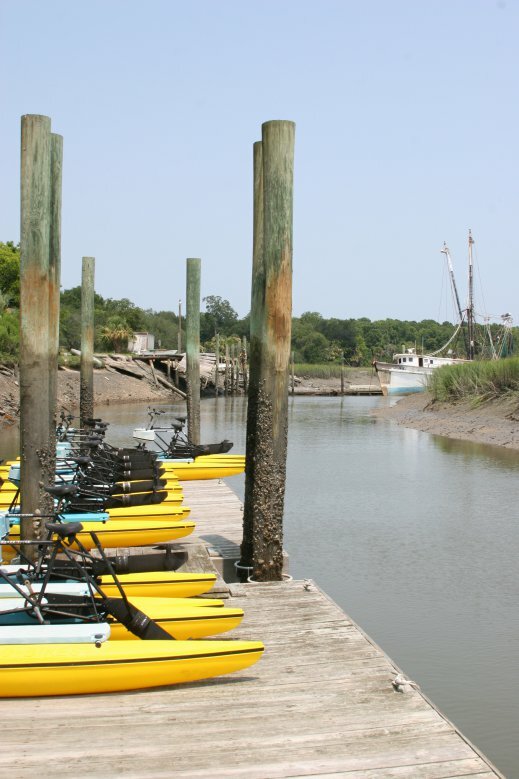 Tides - Jarvis Creek Water Sports, Hilton Head, SC. 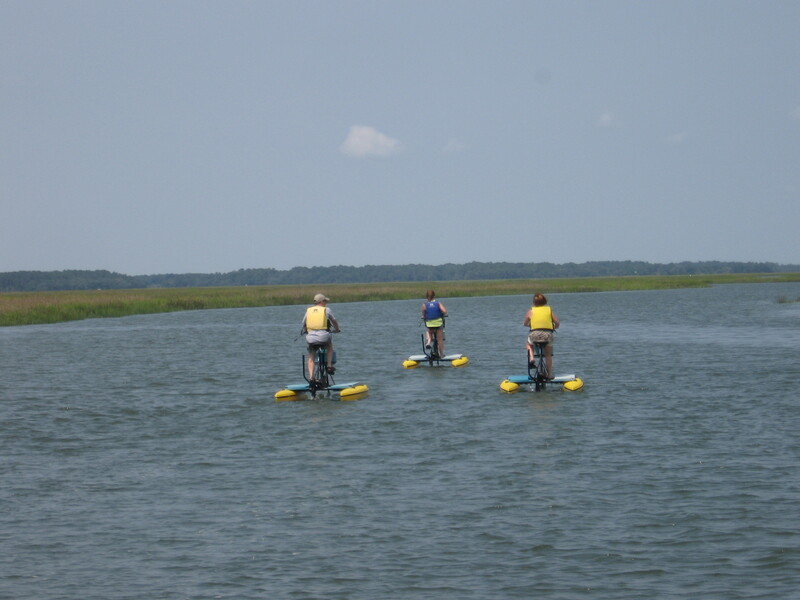 When in Hilton Head Island, SC and other coastal regions planning water activities, you should know the tides. Tides can vary from one location to another along the coast, so talk to local people and / or check tide tables for the area if you know how tides work. The Hilton Head tides have an average change of 8 feet between high and low tide breaking down to about 1.3 feet avg an hour (in reality there is roughly two slack tides for about 30 minutes or so to then about 5.5 hours of current of about 1.6+ feet during that time). The tide will range from 6.5 to 12.5 (+/-) feet difference depending on tide coefficient based on the sun and moons distance and gravitational pull on the earth. Marine geography also helps play a role in tide heights as well. We have one of the greatest difference on the East coast, the same around NY. While Florida and NC has roughly a 2-3 foot difference between high and low-tides but the Fundy Bay in Canada has around a 50 foot difference being one of the greatest in the world. 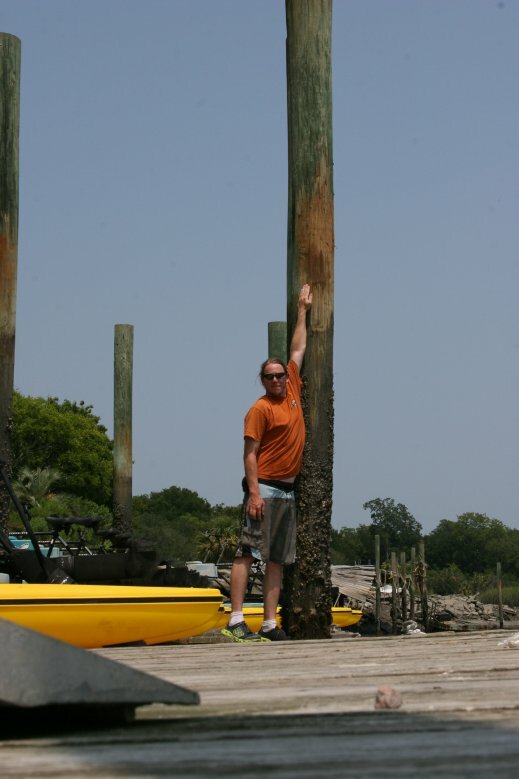 In the pictures posted here, you can see the marks on the poles of the high-tide rub marks (by the dock rings by my feet) out of my reach and I can touch an eight foot ceiling. Also the ramp will be more like a bridge at high tide. 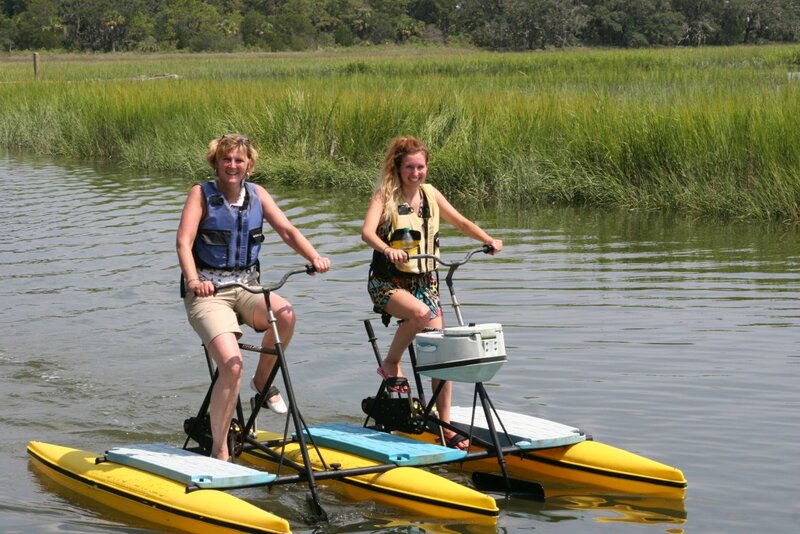 When going out boating, jet skiing, kayaking, paddle boarding or anything especially on the back of the island. You will need to pay attention to the tide of when is high, when is low and which direction it may be moving between tides especially on human powered activities. In between the tides, especially around mid-tide (halfway between high and low tide) the current will be strong and when doing human powered activities, will be more tiresome when going against it. Think of being a fish swimming up river against the water flow. A way to explain this is like riding a bike on the beach on a windy day. You want to ride against the wind to start with since it is difficult and tiring to set the distance. Then when you turn around to come back let the wind push your back since it will be an easy return. Doing the opposite, makes a long difficult and tiring trip back. Unlike the wind as easily, you can time the tides and also provide and easy route both ways riding an incoming and outgoing tide or the opposite. Do not let the tides scare you about going out though, it is something to just be aware of and provides different experiences while in the environment. 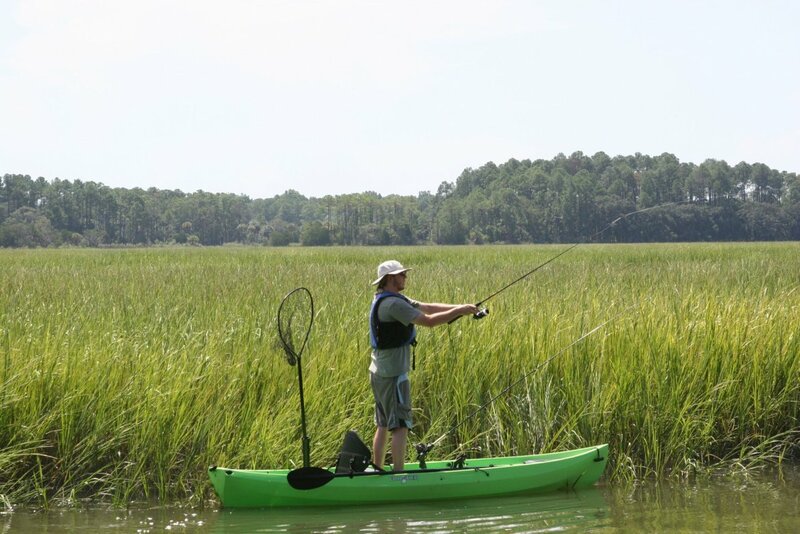 If you want to paddle around in the marsh grass areas of the creek to explore or fish the short grass area and you do not know your way, it is best on an incoming tide (going into high, rising tide) to give you more time in those areas. On an outgoing tide, those areas will become dry and you can get stuck there until the next incoming tide to float you out safely and depending on where you are, it maybe up to several hours. Why can’t you walk out? 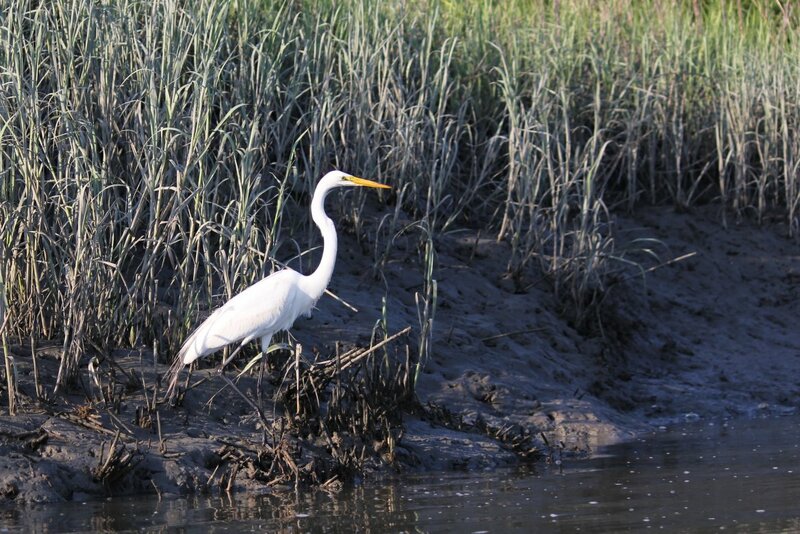 In the tidal marshes around Hilton Head, the pluff mud is like walking on iced sidewalks, very slippery. If you do get your footing, you can sink down to your shin or waist and it sticks to you sucking your shoes off. Also around in those areas are oyster beds or loose shells which are extremely sharp like scalpels. The safest is to wait for the tide to re-float you out. It can be walked out sometimes but is riskier, difficult and very tiring. 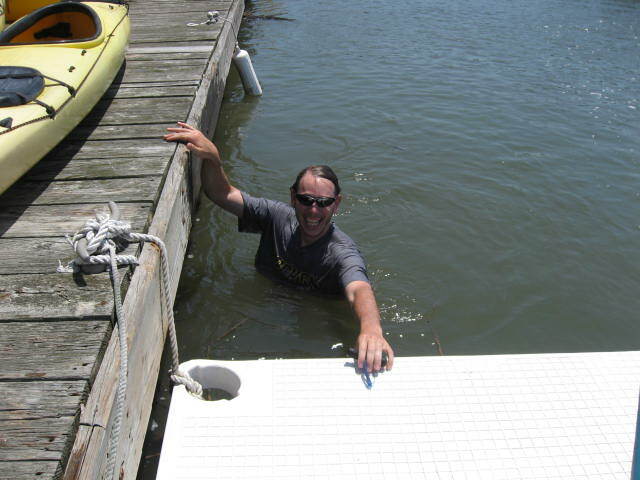 At low tide when going out or the start of an incoming tide, you do not have to worry about getting stuck as much. Around these times provide better wildlife viewing and usually better fishing (just before the tide starts to turn to rise). You can see where the water is and safe to go, also if you do bottom out on shallow sandbar or something, just wait a few minutes and you will float off. It is the outgoing from high-tide in which most attention should be paid too especially in grassy areas. The cord grass grows between 4-8 feet usually in shallow area and along banks. When out at high-tides, if there are open areas in the grassy areas then is could be a smaller off shoot of the main creek our a low lying part of the creek where deeper water maybe. These may help lead you back to deeper water if you know where the main channel of the creek is. 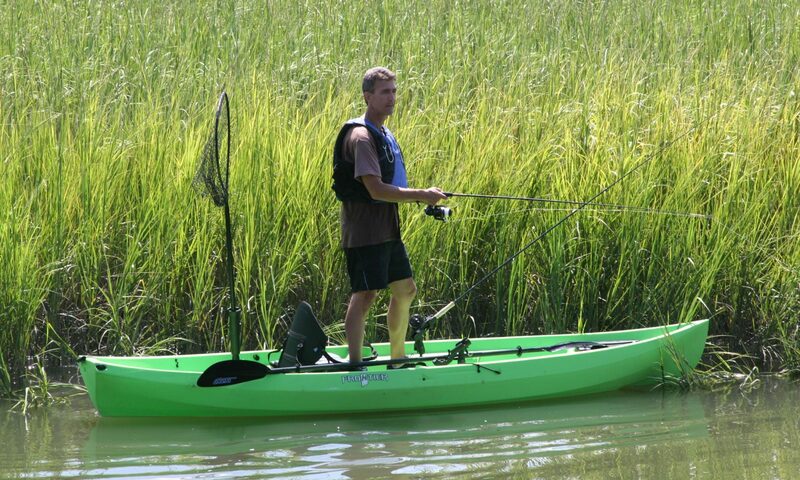 For example of how it may feel kayaking in the creek. At high-tide you can see docks and the shore line fairly easy. At low-tide on the other hand, you maybe lucky to see tree or roof tops for point of reference. Rental or tour outfits should be able to help explain more of this if you have further questions. Anytime is a great time to go kayaking in the creek (except during bad weather). If you are planning a guided tour, then your guide will plan a route depending on the tide. It is always recommended when going out kayaking to know the tides for the day or the time of the next rotation when you are going out in the water. If possible, plan a route in which you paddle against the current to start and then can ride the current back to the your end point. This way you do the hard stuff first, you can judge how far you can go and this way you can return safely with little energy. 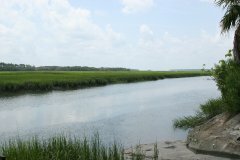 Check out the Jarvis Creek Tide charts. 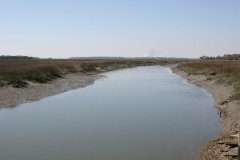 What do the different tides offer? 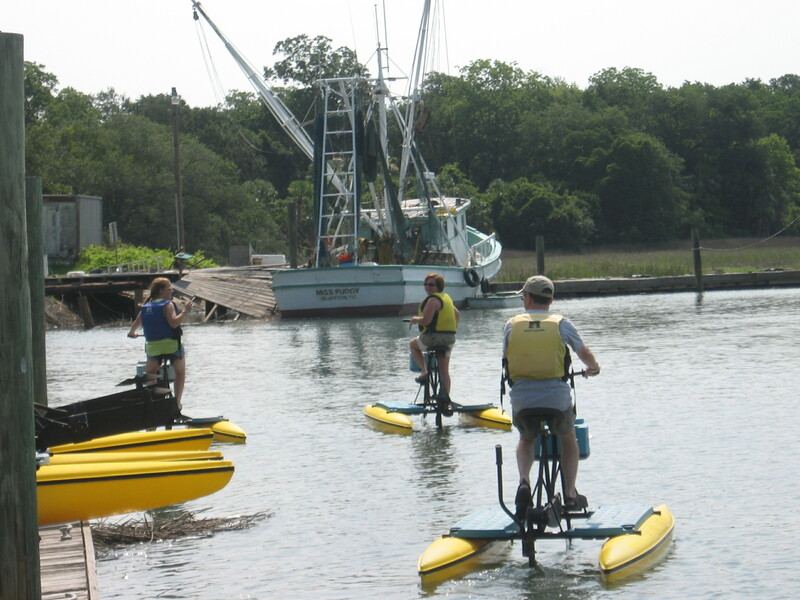 At HIGH TIDE, you have a wide selection of routes to explore around in the creek and can get under some of the canopies of the oaks overhanging the creek. 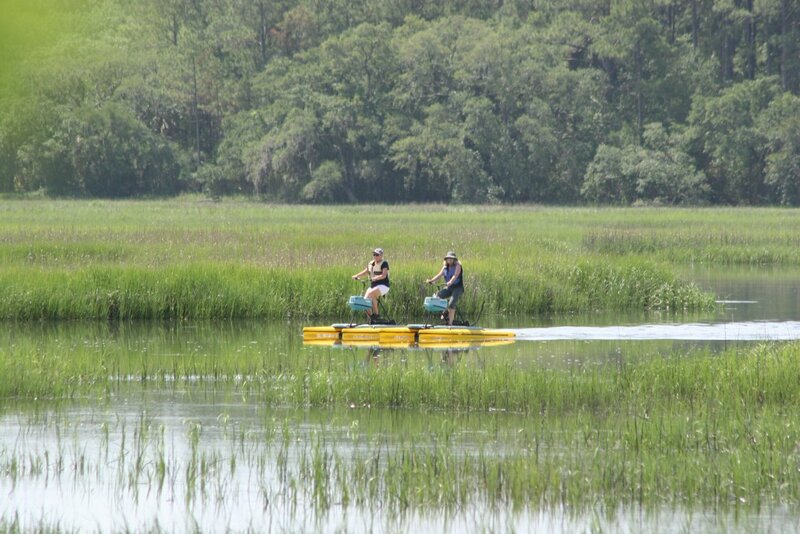 There is also a marsh maze (like a corn maze but in a kayak) which is fun to explore. 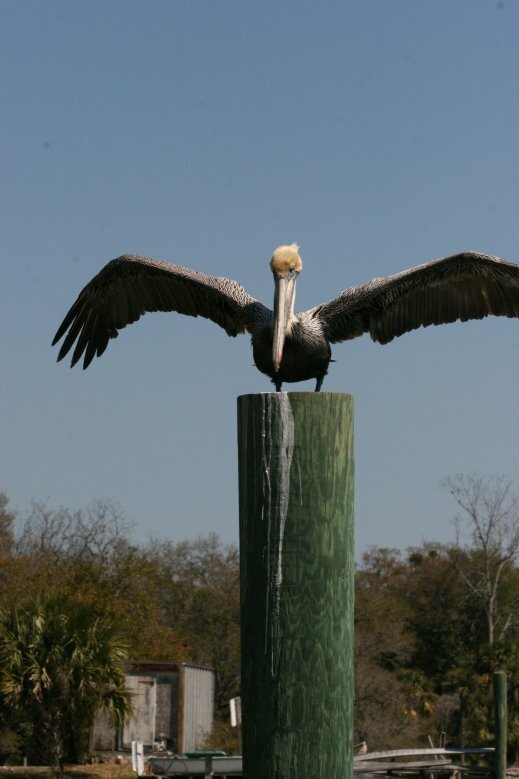 Wildlife viewing at high-tide is a little more limited but the guide can help point you in the direction of sightings. At MID-TIDE, you have the best of both worlds. There is still a selection of routes in which you can take creating a loop and explore out and about in the creek. The water is low enough where you can see some nature along the creek banks. The down-side of a mid-tide will be the current in at least one direction will be strong when you have to go against it. At LOW-TIDE, there is limited selection in routes available for the kayaks since the creek is shallow then. The low-tide offers generally the best wildlife viewing. 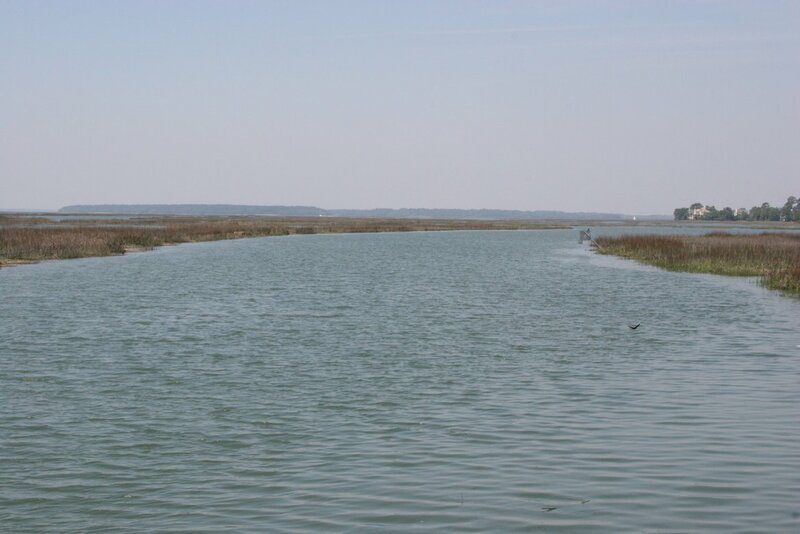 Birds like to do there fishing then along the shallow banks and low-tide has the highest odds of seeing dolphins feeding since they can trap the fish in the shallow waters. 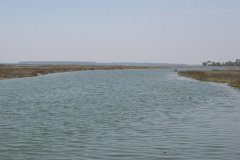 Also, will usually be around the best time for fisherman to setup before the tide switches to rise to catch funneling in fish which will feed up in the short grass flats at high-tide. 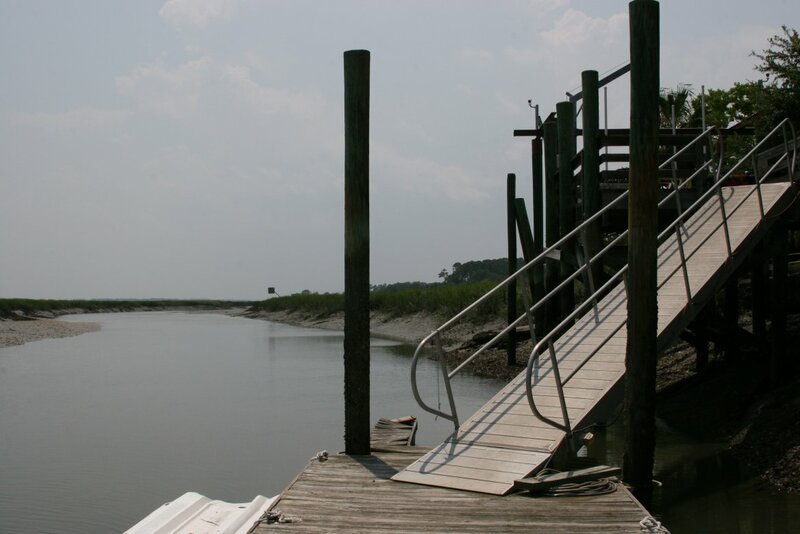 The high and low-tide photos above were taken from the same place on the dock looking at the same part of the creek with the only difference is in time of day and tides. In the high-tide picture the water is over your head being about 7-14 feet deep depending on location of channel. In the low-tide picture you can walk the same area where some spots are dry while others may only be shin to wait deep.